Resisted running/sprinting is a great way to develop speed and agility. Methods of resistance may include gravity (running up hills or stairs) or overloading (parachute or weighted sled). When running with resistance, it is important that the athlete maintains proper running mechanics, in order to improve speed-strength and stride length. Generally, a 10% increase in external resistance is adequate, since loads of greater than 10% may have a detrimental effect on overall technique (dependent on the athlete). You don’t want the athlete to slow down and “muscle through” each stride. Ideally, you want the athlete to maintain explosive arm and knee punching action, andexplosive leg drive off the ground. 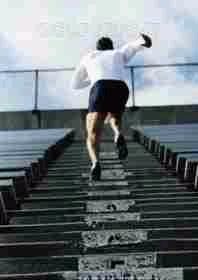 Running up hills or stadium stairs will definitely increase the intensity level of your workout. 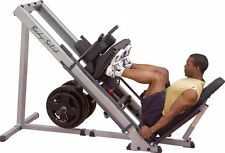 It will also benefit your speed, strength, agility, and cardiovascular fitness. And you don’t necessarily need to find a hill. An area with a grade of as little as 5-10% will do. For stadium stairs, check out your local high school football facility. If you have access to a parachute or weighted sled, I would encourage you to try them (run against the wind with a parachute). You won’t need to run long distances. 40-50 yard sprints are adequate for parachute running, and 15-20 yard bursts are sufficient for the weighted sled. As with other modes of high-intensity training, allow adequate rest intervals between sets. Generally, a 10% increase in external resistance is adequate, since loads of greater than 10% may have a detrimental effect on overall technique (dependent on the athlete). You don’t want the athlete to slow down and “muscle through” each stride. Ideally, you want the athlete to maintain explosive arm and knee punching action, and explosive leg drive off the ground.